Tindie (Czech Republic) offers the CAN32 board. It features the ESP32 processor with on-chip CAN module and the SN65HVD230DR transceiver by Texas Instruments. The ESP32 processor by Cadence Tensilica will provide an on-chip CAN module. Engineering examples are already available. The CAN32 board comprises a CAN transceiver with sleep-mode functionality as specified in ISO 11898-5. The module is also equipped with the CP2102N USB-to-UART chip by Silicon Labs. Additionally, it provides a 15-V regulator and a micro SD slot. The development board uses gold-coated pads. The broken-out pins can be used for adding various other modules and sensors. The development board is powered by 3,3 V or 5 V (via USB). Unfortunately, no documentation for the CAN interface is provided. The Rs pin of the CAN transceiver is connected to pin 27 (IO16) on the ESP-Wroom-32 and needs to be driven low. The Arduino example code does not do this. Each board is tested, CP2102 pre-configured, and an Arduino Wifi-Scan example is pre-programmed. 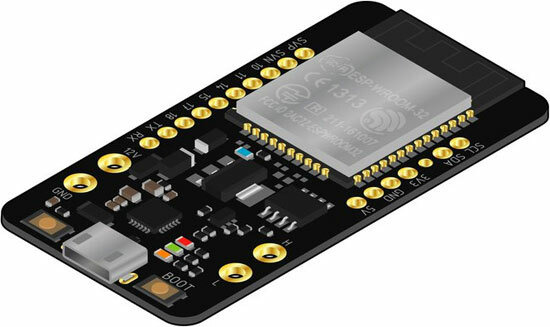 Espressif, a Shanghai-based Chinese company has designed the ESP32 processor. Taiwan Semiconductor (TSMC) manufactures it. Furthermore, the Chinese company has developed several WiFi-Bluetooth chipsets and modules.